In which part of the Africa would you find the famous Swahili Coast? 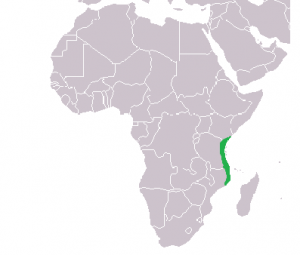 The Swahili Coast is a coastal area in Southeast Africa inhabited by the Swahili people. It mainly consists of littoral Kenya, Tanzania, and northern Mozambique. The term may also include some of the Indian Ocean islands, such as Zanzibar, Pate and Comoros, which lie off the Swahili Coast. The Swahili Coast has a distinct culture, demography, religion and geography, and as a result – along with other factors, including economic – has witnessed rising secessionism. The Sahara has a number of distinct physical features, including ergs, regs, hamadas, and oases. Among these features, which of the following makes up nearly 70 percent of the Sahara? The Sahara has a number of distinct physical features, including ergs, regs, hamadas, and oases. Ergs, which cover 20 percent of the Sahara, are sand dunes that stretch for hundreds of kilometers at heights of more than 300 meters (1,000 feet). Ergs cover most of Algeria and Libya and parts of Mali and Nigeria. Ergs can contain large quantities of salt, which is sold for industrial and food use. Regs are plains of sand and gravel that make up 70 percent of the Sahara. The gravel can be black, red, or white. Regs are the remains of prehistoricseabeds and riverbeds, but are now nearly waterless. Hamadas are elevated plateaus of rock and stone that reach heights of 3,353 meters (11,000 feet). They include the Atlas Mountains, which stretch from southwestern Morocco to northeastern Tunisia; the Tibesti Mountains of southern Libya and northern Chad; and the Ahaggar Mountains in southern Algeria. An endorheic basin is a limited drainage basin that normally retains water and allows no outflow to other external bodies of water, such as rivers or oceans, but converges instead into lakes or swamps, permanent or seasonal, that equilibrate through evaporation. Such a basin may also be referred to as a closed or terminal basin or as an internal drainage system or Interior drainage basin. The Okavango Basin is an endorheic basin found in southwestern Africa, which extends across portions of Angola, Botswana, Namibia and Zimbabwe. The basin covers an area of 721,000 square kilometers. The Okavango River is the chief stream in the basin. It is formed by the confluence of the Cubango and Cuito rivers, which originate on the Bihé Plateau of central Angola and flow southeast. Which of the following is/are part of seven major African Great Lakes? The Great Lakes are located in nine countries that surround the Great Rift Valley. As the African continent separated from Saudi Arabia, large, deep cracks were created in the Earths surface. These cracks were later filled with water. This geologic process created some of the largest and deepest lakes in the world. 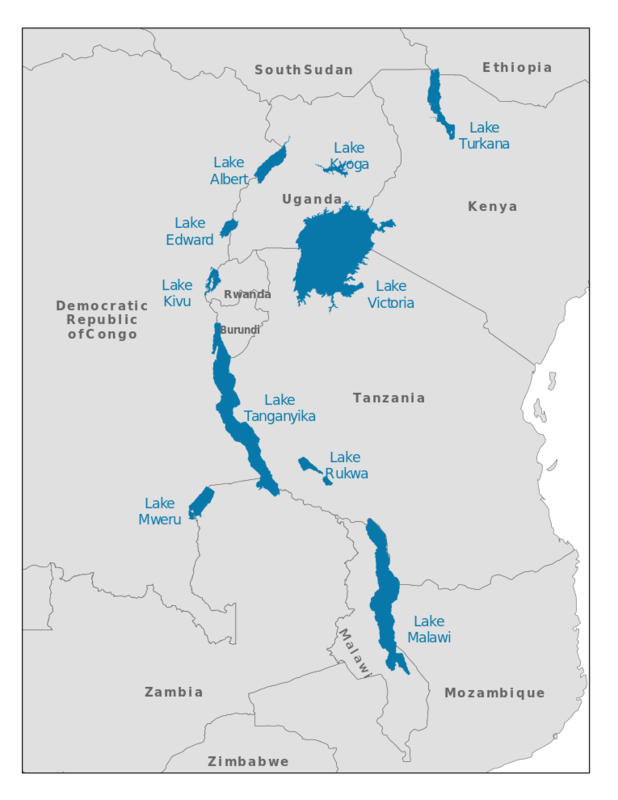 There are seven major African Great Lakes: Lake Albert, Lake Edward, Lake Kivu, Lake Malawi, Lake Tanganyika, Lake Turkana, and Lake Victoria. Lake Victoria, the largest lake in Africa, is the southern source of the Nile River, the longest river in the world. The African Great Lakes region has a diverse range of aquatic and terrestrialanimal life. Fish include the 45-kilogram (100-pound) Nile perch and the 2.5-centimeter (1-inch) cichlid. Migrating savanna animals, such as wildebeest, use the lakes as watering holes. Hippos and crocodiles call the region their home. The Great Lakes abut everything from rain forest to savanna plant communities. However, invasive species like the water hyacinth and papyrus have begun to take over entire shorelines, endangering animals and plants. The drying out of the Theewaterskloof Dam has resulted in severe water scarcity in which of the following cities? Cape Town’s main water supply, at the Theewaterskloof Dam, is running dry, and the city may soon have to turn off its taps.